This article first appeared in issue 15 of the Barbel Society Magazine “The Barbel Fisher”, Spring 2003. Every once in a while, you catch a fish, which – though it may not be a monster – nevertheless means something special to you. It may be something to do with the nature of the capture, the use of experimental baits or tactics, the result of a long campaign, whatever – the pleasure of the catch far exceeds that which you would normally get from a fish of that size. This is the story of one such fish. 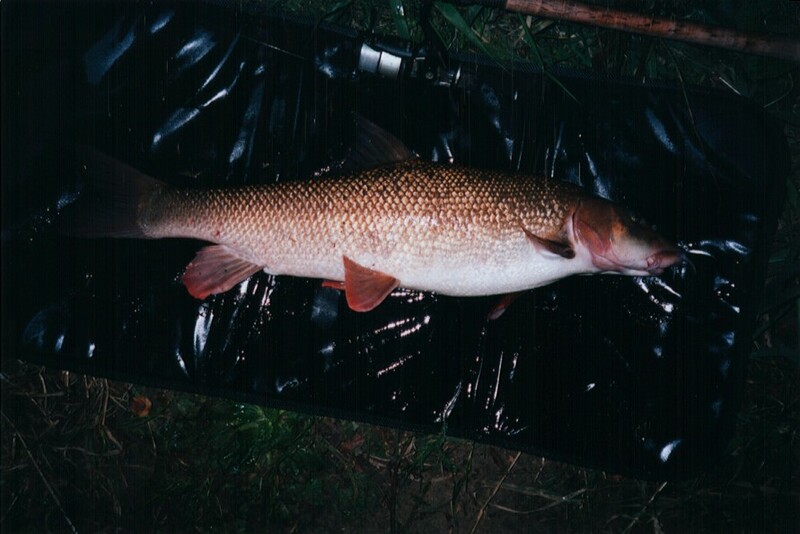 I had decided prior to the 2001/02 season that it was about time I had a barbel from the River Cherwell. Although it’s only about 30-odd miles from home, I’d fished it just once before, and that was in a club match. Having done a bit of research via the Internet, I found a club that has a fair amount of barbel-holding water on the river, and obtained a membership card. A couple of weeks into the season, I paid my first visit to one of the club’s waters. It certainly looked the part, with a host of swims that seemed as though they should hold barbel. Overhanging trees, rush beds, narrows, wides, shallows, deeper glides, it had the lot. Except, apparently, barbel. On my first visit, I spotted a shoal of a dozen or so chub, all looking around four pounds and over. I caught one, and this was the last time I saw anything bigger than a dace there for the rest of the season. The venue is about two miles long, and I must have walked about fifty miles up and down the stretch over several weekends, feeding swims, watching and waiting just trying to locate a barbel. They had to be there somewhere, but they were keeping well hidden – if only I could see just one, I’d know I was on the right track. But there was not even a hint of a barbel to give me encouragement. Confidence was rapidly beginning to fade. I had known from the start that it wasn’t going to be an easy river to get to grips with, but this was turning out a lot tougher than expected. Signal crayfish were a major nuisance, and soft baits literally would not stay attached to the hook for longer than five minutes, before being demolished by these pests. I started to use boilies to overcome this problem. This was partially successful, in that the baits resisted the efforts of the crayfish to remove them – though they still had a damn good try – but didn’t prove to be any more successful in attracting fish. Just to make matters worse, one day I managed to fall in, having mistakenly assumed that the thick grass I was stepping on to had solid ground underneath it. This was a bit disconcerting for a while, as the bag on my back spun me over and tried to drag me under. Fortunately I managed to right myself and scrambled out. Naturally, it rained all day, so there was no chance of getting dry, and I sat out the rest of the session feeling wet and miserable. Soon after this something dawned on me. 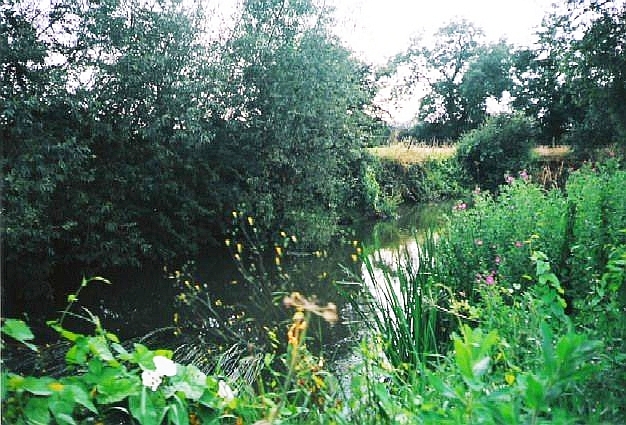 To date in my angling career, I’d caught barbel from twelve different rivers – the Cherwell was definitely proving to be the unlucky thirteenth. Now I’m not superstitious, but I did start carrying a rabbit’s foot, and only fished swims that had four-leafed clover on the bank! By the end of September, I’d had enough, and turned my attentions to a relatively easy section of the Kennet, just so that I could get a bend in my rod (ooh err missus!). I promised myself that I would return in the winter if conditions were right, but somehow never got round to it. March arrived, and the club card was due for renewal. What to do? Do I stick with it for another season, or look elsewhere for my sport? I decided to give it another chance and renewed for the 2002/03 season. The new season saw me on another of the club’s waters, a little way upstream of the one I fished last term. Again, it looked good, but I didn’t allow myself to get carried away with that after last year’s experience. My first visit produced a couple of chub, so that was a mildly promising start. Then next time out – glory be – I actually spotted two barbel together. 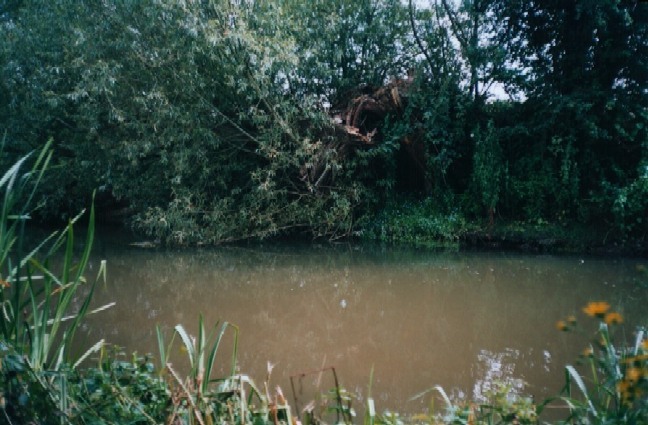 So it was true – there are barbel in the Cherwell! The bad news was that they were in a completely unfishable spot, with nine feet high banks dropping sheer to the river and no access for 30 yards in each direction. Landing a fish would have been impossible from there. 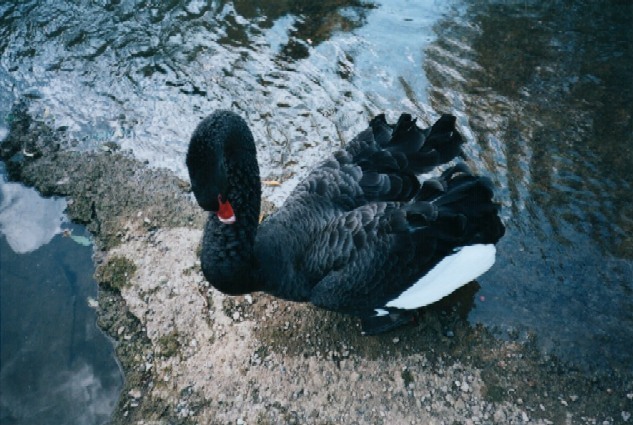 I baited as near upstream to them as I could get, but they stubbornly refused to move from where I’d first seen them. Six chub to 4.00 were some consolation, and the fact that I was catching fish, albeit not the ones intended, was encouraging. Several more chub were to follow in the next couple of weeks, including one that I caught three times in two sessions. At least they found my boilies appetising. By now I had established three swims that produced chub regularly, and I felt sure that these swims also had a decent chance of holding barbel. During the last of those sessions, I’d overcast trying to fish tight to the far bank, and the hook-length had firmly snagged up in a small bush. I had no choice but to pull for a break. When the hook-link parted, the lead came shooting back at me, smashing into the knuckle of one finger. This was, to say the least, extremely painful. The knuckle had split open, dripping blood everywhere, and by the next morning, the finger was bruised, swollen and very sore. What with last season’s unscheduled dip, the Cherwell was proving dangerous to my well being. I’d healed sufficiently to return a week later. The three “consistent” swims I’d identified were baited up, along with a couple of other “possible” swims. Fishing them all in turn, I began to wonder if even the chub had now deserted me, as I didn’t have a bite until gone eight in the evening (I’d arrived about three o’clock). However, I then had a small chub from one of my main swims, followed up by another from a secondary swim. For the last hour of the session, I returned to where I’d had the first chub. A few minutes into the first cast, the rod suddenly took on an alarming curve. Lifting into the fish, I knew instantly that this was no chub, as something powerful surged away and under the overhanging willows on the far bank. With the rod tip at water level, I managed to turn the fish, and bring it back into open water. Once there, I felt reasonably in control, though every head-shake and dive had me momentarily thinking the hook would pull or the line would snap. After a very lively few minutes that left my heart pounding and mouth dry, I slipped the net under a fine barbel. As usual, I left the net in the water for a couple of minutes to let the fish get it’s breath back, while I did a little celebratory jig, and let out a whoop of joy. Just as well I was alone on the venue! I can’t really express in words the sense of satisfaction I was feeling at that moment. Lifting out the net and placing it on the unhooking mat, I could see that the fish was in super condition. On the scales, the needle settled at exactly eight pounds. I took a couple of quick photos, then returned it to the river, holding it there for a while, before it kicked healthily away. There would have been time for one more cast before I had to be off the water, but I couldn’t bring myself to make it. I just kept saying to myself “Yes! Flipping brilliant!” – or words to that effect – over and over again. I still couldn’t quite believe that I’d finally managed that elusive Cherwell barbel. Though I’ve caught a fair number of bigger fish in my time, this capture has given me more pleasure than almost any barbel since I first broke the ten-pound barrier some ten years ago (with the exception of my PB). I certainly felt like I deserved it, after all the trials and tribulations that I’d been through to get it. There was also a distinct sense of relief that all the effort had not been in vain. Postscript: I went after that Cherwell double, and a few weeks after this piece was written, succeeded with a fish of 10.07. The Colne is yet to be addressed.